Soldiers pack the Beaufort concert hall for the afternoon matinees. Sgt Major Kench is standing at the back. The Beaufort was never short of entertainment for the recovering soldiers. There were visits to Bristol Zoo and The Hippodrome, Charabanc rides to the countryside, cricket and football matches. 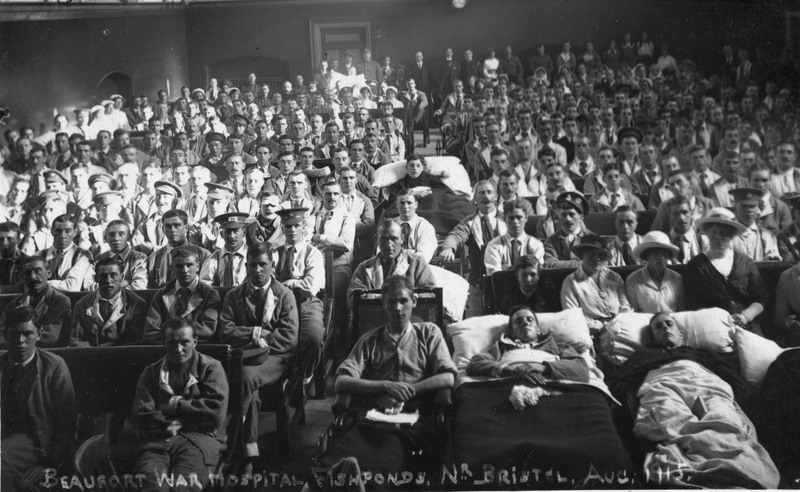 Bristol was renowned for it’s care of the returning wounded, and many local businesses held sports days and grand tea parties. Beaufort had its own theatre: on Thursday afternoons, the Music Hall stars from the Hippodrome would perform in a matinee, which included singers, dancers, acrobats and variety acts. There were also frequent concerts given by the staff and soldiers, in which Sergeant Major Kench was a regular performer. Quite a furore greeted Sergeant-Major Kench with his “Toreador” song, and acceding to the popular demand, he was persuaded to sing again.